Crawford & Company (Thailand) Ltd. Huge areas of Thailand have been affected by the worst floods in decades. More than 500 people have been killed with hundreds of businesses and industrial areas affected. Early estimates are that US$10 billion of insured damage has been caused by the floods. Crawford & Company is monitoring the situation and its potential effect on our clients. Crawford Global Technical Services (GTSsm) recently hosted a market event to update key insurance audiences on the situation following the devastating floods that hit Thailand during 2011. Update and overview of the major issues around coverage and settlement. Reports labeling the Thailand floods as amongst the costliest natural disasters ever experienced in South-East Asia increased during the last few days as the waters continued to recede. Many areas of Thailand remain flooded, especially those to the west and east of Bangkok, and it is still expected to take many weeks for all water to reach the Gulf of Thailand. The government estimates that it will take as long as two months for the flood waters to fully recede. With Bangkok expected to completely give way to rising water levels over the coming days and the country's industrial region Ayutthaya to the North of the city largely submerged, Crawford's adjusters continued with efforts to help customers, many of whom have been left in almost complete isolation caused by the worst floods in over 50 years. 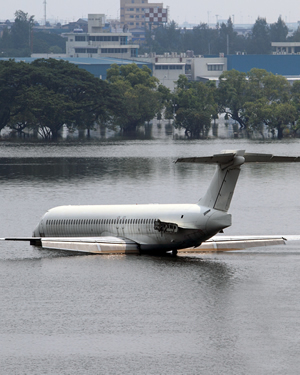 Floodwaters in Bangkok have reached Don Muang Airport, one of the Thai capital's two main airports and home to the flood relief operation command, which may have to move to another location, according to the governor. In the east, the industrial estates of Lat Krabang and Bang Chan remain under threat, and volunteers are being sought for help with sandbagging. The rain continues to fall relentlessly with the worst-affected areas being the north, northeast and central plains of Thailand, with the death toll continuing to rise. Extensive flooding continues to wreak havoc throughout Thailand, where the 10 worst affected provinces include Uthai Thani, Chainat, Lopburi, Singburi, Ang Thong, Ayutthaya, Nakornsawan, Chachoengsao, Pathumthani, and Nonthaburi. Approximately 30 of Thailand's 77 provinces are reportedly underwater at present.